After being tutored by the legendary Jackie Silva in the mid-1990s, three-time Olympian Sandra Pires has assumed the role as the player/coach as she starts her 13th season on the SWATCH-FIVB World Tour tutoring Brazilian indoor veteran Virna Dias after spending 2005 with Agatha Bednarczuk. Sandra will turn 33 during the 2006 season. Sandra joined forces with Adriana Samuel at the start of the 1998 SWATCH season as the pair played together through the 2000 season. Sandra and Adriana were fourth at the 1999 SWATCH-FIVB World Championships in Marseille before claiming the bronze medal at the Sydney 2000 Olympic Games. After playing with Tatiana Minello (2001, 12 events, 53-22 match record, Goodwill Games gold medal) and Leila Barros (2002, 11, 32-18) the next two seasons, Sandra teamed with Ana Paula Connelly in 2003 to pursue a spot in the Athens 2004 Olympic Games. Highlighted by the 2003 SWATCH points championships, Sandra and Ana Paula qualified for the Olympics where they placed fifth. Due to injuries, Sandra and Ana Paula played in only 16 SWATCH events with five gold medals, nine medals and an 81-17 match mark. Pires is one of 14 players to compete in all three Olympic Beach Volleyball competitions. She had a 5-0 record with Jackie in Atlanta, 4-1 with Adriana in Sydney and 3-2 with Ana Paula in Athens. Only Natalie Cook of Australia has won more Olympic Beach Volleyball matches (13) than Sandra (12). Sandra was also honored by her country�s Olympic Committee at the Sydney 2000 Games by becoming the first women to carry the Brazilian flag into the opening ceremonies. 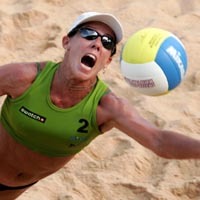 On the Brazilian domestic tour, Sandra has won the 2000 and 2001 Queen of the Beach competition. She teamed with Jackie to win the 1995 points title followed by championship with Adriana in 1998. She finished fourth in 2005 with Agatha.